This month we have talked about surviving the valleys of life and marriage. Then we looked at how to make the most of the highs. 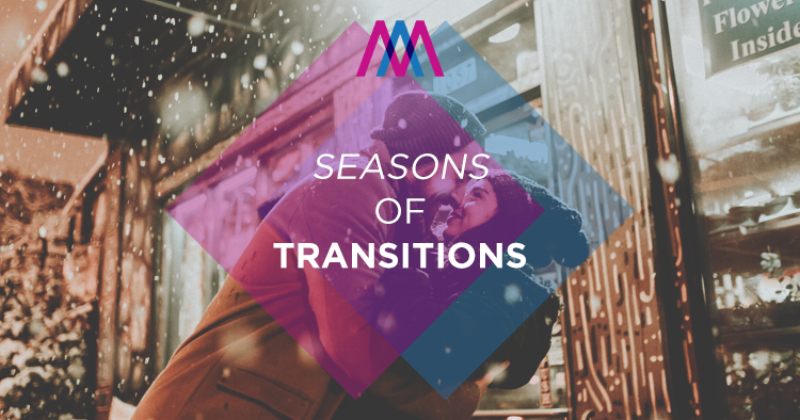 Finally, we looked at dealing with the transitions that we encounter in marriage. Now comes probably the most difficult kind of season that couples deal with together: seasons of waiting. The first five years of our marriage were both difficult and exciting. God did a lot of work in both of us and in our marriage during those years. It was after two years of marriage that we decided we wanted to start a family. We knew it might be difficult or take awhile because of a surgery Nancy had before we were married. I was having a lot of fun with the process but it began to take a toll on Nancy as month after month the pregnancy tests were negative. Over the next couple of years, Nancy went through procedures and a major surgery. Each time we got our hopes up but each month’s results were the same. The waiting was beginning to wear on both of us. Then God began to work on both of our hearts and we both came to the decision of adopting at literally the same time. We were ecstatic about the idea. We knew that was God’s plan for us and we loved it. What we did not realize was that we were going to go through another season of waiting as we applied, were accepted, and waited on our baby. The adoption process took over a year and that was on top of the four years we had been trying. We made matters worse by getting the nursery ready right after we were accepted. It was hard for both of us, but especially on Nancy as she looked in that nursery with an empty baby bed month after month. Seasons of waiting are tough. Some of you are in one now and some have been there. Our season of waiting ended with a baby. I know for every couple that is not the case and I know that there are many different kinds of seasons of waiting. Many don’t involve having a baby, but may involve sickness, financial hardship or something else. Whatever the season of waiting, this is what we learned. God does have a plan for each of us. We don’t always understand His plan but it is always good. The outcome may be different than what we wanted and sometimes different than what we prayed for, but it will be perfect for us. Let God grow you closer to Him and to each other in your season of waiting. I remember thinking something like this the first year of our marriage: “If we can get it right this first year, we will have it made for the rest of our lives.” Okay, give me a break. I was just twenty-two. What I learned rather soon was that if we were to have the marriage we both wanted, it was going to take a lot more building time than I originally thought. Looking back, I remember thinking many times that we had finally arrived and then something changed. It was probably somewhere after we had our second child that I realized that our marriage was going to keep going through changes. Going from no children to the first was a change. Going from one child to two was a change. Nancy going from not working outside the home when the kids were little to later starting a career was a change. My going back to school to pursue ministry after working in the family business was a change. The changes just kept coming and there was season after season of transition. Each season and each time of transition has had its blessings and its challenges. For us, the turning point came when we finally accepted that our married life would go through changes and then learned to embrace those changes. Looking back, we had two choices. We could embrace each season as it came or we could try to hold on to things as they were. Embracing transitions was not always easy but it was the right decision. It allowed us to see what God was doing and what He wanted us to do in each season and each transition. You are either in a season now or transitioning from one to another. It’s inevitable and there is joy to be found in both. The more you are able to embrace the transitions, the clearer the blessings become. I love the highs of marriage. I love the days when we are connected and our love grows. I love having fun together and really enjoying each other. I love it when we have things that we celebrate together. I don’t think that I am alone in that. All of us love the highs. Here is my take on all of the above. I believe there are highs throughout every marriage, but I think for some reason we don’t always embrace them together. We forget to celebrate and embrace them. Sometimes that happens after we have been in a valley. We come out and survive but maybe we lost something in the process. Sometimes we just drifted apart and have lost some of our passion for the highs. Think back to a time in your marriage that you really did a great job of making the most of your highs together. What was different then? What gets in the way of getting back to that type of celebration? I believe that God is there every day of your marriage. He is there in the highs and in the lows. He makes the highs higher and the lows much easier to walk through. If we really stop and think about it, there is something to celebrate every day - even in the valleys. If it is just the fact that we have a God who loves us unconditionally, isn’t that something to celebrate? Here is what I want you to take away from this blog. There are highs in marriage. When they come, do not miss embracing and celebrating them together. In the other times of marriage, when we don’t see or feel a high to celebrate, go back to the basics. Experience the joy of knowing a God who loves you both and is always with you. Have you ever wished that there were no valleys in your life and your marriage? Maybe you have prayed for that. I have. I don’t like the valleys and often they scare me. There is a fear of the unknown as we enter them. Then we don’t understand what is happening, how long it will last or what the end result will be. If I could have a valley-free life, I would sign up today. I would even give up the highs to get a level playing field in my life. No highs but also no lows. That’s my thinking and in my humanness is makes perfect sense. But as a child of God, it makes no sense at all because of one thing. It’s in the valleys of my life that I have met Jesus face to face. It’s in those times when I don’t understand that I realize He does. He knows how long the valley will last and what the end result will be. It is in the valleys of my life that real change takes place. The same has been true for Nancy and I in our marriage. We both have gone through dark seasons of depression. We experienced days when we could barely function, but you know what God did during those times? He drew us both closer to each other and to Him. Our marriage is better and more connected today because of those valleys. Do I like valleys? No. Has God brought good out of them? Absolutely. Do I want another valley? No! BUT I know Who I will meet there if it happens and I have learned to trust Him in the valleys just like I do all the other days of my life. I promise you this. If you are in a valley now or if you walk into one in the future, look for Jesus. He is there with you!